What else do you need to release your next album? | . astrakan project . What else do you need to release your next album? … You need Gesso!!! Or at least, I need gesso! What? Gesso is a primer used to coat canvasses or paper before painting, especially loved and treasured by artists that love multiple layers and materials as well as heavy textures. Well… like me! I love gesso. And I still don’t know how I run out of my precious primer, (well, no, not completely, I still have some black gesso 😉 ) , and not only I run out of gesso, but also I haven’t found so far any art-shop in my area in Greece (around Kavala, if you happened to be reading and know one, please! Don’t let me down, leave me a comment!). Not only did I run out of gesso, but I’m painting for next album cover (ho, here comes the album! ), so, what can I do? So what else than go back to the old Do It Yourself method. Yes. Again. I found an easy recipe here. 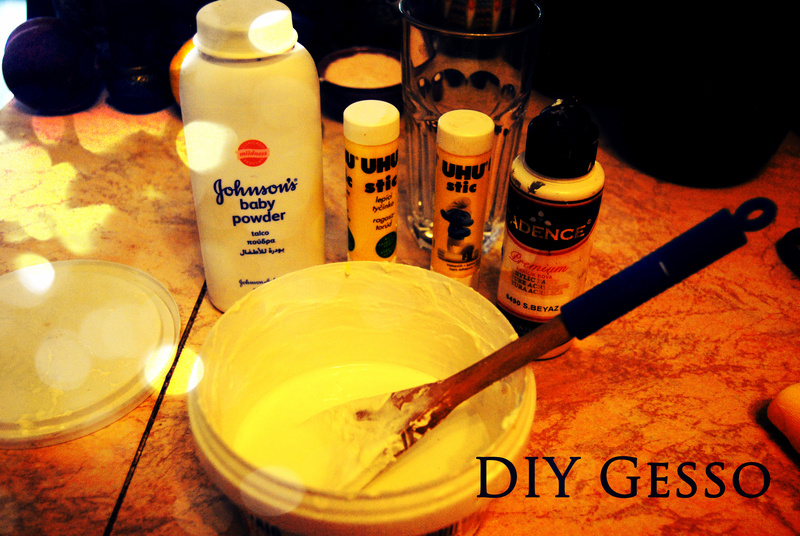 Basically baby powder+white glue+water. I chose to add some very white paint. I’ll wait until tomorrow to allow it to settle.